We have been working closely with Jayne Allman, founder of Banana Enterprise Network, to support her range of courses for new start ups in Salford. Jayne has been successful in raising funds from various sources to provide innovative support for her clients. Funds raised means that she can offer her clients free access to our Planning and Starting Your Business course. She offers grass-root level, face-to-face vocational enterprise courses that are aimed at equipping disadvantaged people with enterprising skills/knowledge and interpersonal skills. Through working in partnership with Essential Business, Jayne has been successful in securing more funding to expand her offer by engaging clients on Essential Business’s online courses. Essential Business has supported #MicroBizMattersDay for the last few years, and Marianne fulfilled her ‘Head Roadie’ duties again this year, helped by her ‘Micro Roadies’ (aka, her twins, Harry and Ellie). As our contribution to the Enterprise Rockers’ focus on learning, we are delighted to offer 13 free marketing resources as our way of supporting #MicroBizMattersDay and the #IGave13 initiative. Visit the pageto find out more. At the IEEC conference in Liverpool, Marianne met with Willem Odendaal of SA Entrepreneurial Development Hub NPC (SAEDH) in Cape Town, South Africa. Willem has been instrumental in developing the ‘Bottom Up Approach’ to enterprise training, having worked with entrepreneurs in developing countries for a number of years. There’s much synergy in the work of our organisations, being both interested in plain language, readily understandable materials and courses that offer measurable results. We have been fascinated to learn how SAEDH has worked with people in very tough economic situations but with amazing entrepreneurial drive and ambition. When business is your only way of making a living, the way it is taught becomes vitally important. Our founder, Julie Stanford, was deeply honoured to be awarded an honorary Master of Arts degree by University of Brighton in its Winter 2016 graduation ceremony, held at Brighton Dome on 12th February 2016. The award was given for her work with the Brighton & Hove business community, particularly with Brighton & Hove Chamber of Commerce. Marianne Whitfield, Julie’s co-director, was a VIP guest for the ceremony (our thanks to the brilliant Tony Robinson for making their photo his Winter winner!) and together they joined local dignitaries at Brighton’s famous landmark, the Royal Pavilion, for the Vice Chancellor’s lunch. As I ran my various businesses, I often felt an odd tension between ambition and wanting to make good money, but at the same time, being concerned about putting something back and helping to make our city a better, fairer place to live and work. So, how did I manage to bridge that gap, to ease that tension? Well, I did it – completely coincidentally – through working with various voluntary organisations and that’s what I want to talk a bit more about today: Volunteering and the fantastic opportunities it can offer you, in terms of skills, network and personal development. She went on to explain how volunteering can enrich your life by introducing you to a new and wider network of like-minded people and offering you the opportunity to stretch yourself beyond your perceived limits. Essential Business is a long-time supporter of enterprise agencies and so it was great to be at the National Enterprise Network 2015 conference in London. We met up with a number of our existing customers and made some exciting new contacts. The conference was very well attended, and there was ample opportunity for networking – along with a packed programme of interesting and inspiring speakers. Paul Oggelsby, founder and managing director of Riverlite (riverlite.co.uk) was interviewed by Declan Curry about his journey from start up to running a successful cloud services company, and it was fascinating to hear Paul talk about how the most simple issues caught him out in the early days. When asked ‘What advice would you give someone who is looking to start their own business?’ Paul said, ‘People don’t study how to set up a business enough before they start up’. We wholeheartedly agree, Paul -– which is why we produced the Essential Business Guide. We want people to learn this stuff. It’s not rocket science but you simply don’t know what you don’t know. Paul’s determination to learn business properly has got him to where he is now. And very well done to him! We were delighted to attend the latest International Enterprise Educators Conference (IEEC) conference at Anglia Ruskin University in Chelmsford, and it was great to meet up with some of our existing clients, and meet so many new contacts. IEEC is a leading international conference on enterprise and entrepreneurship, run in partnership between Enterprise Educators UK (EEUK) and the National Centre for Entrepreneurship in Education (NCEE). The conference brings together over 300 enterprise educators each year, offering them an opportunity to share their experiences and ideas. Members of EEUK can still receive a 20% discount on all Essential Business materials, including the LMS. Julie and Marianne continue to use their combined skills and experience to create high-quality learning and reference materials for small and micro business owners and the people who advise, teach and support them. 20% discount on all Essential Business publications and courses. We’re looking forward to making new friends in the Network. 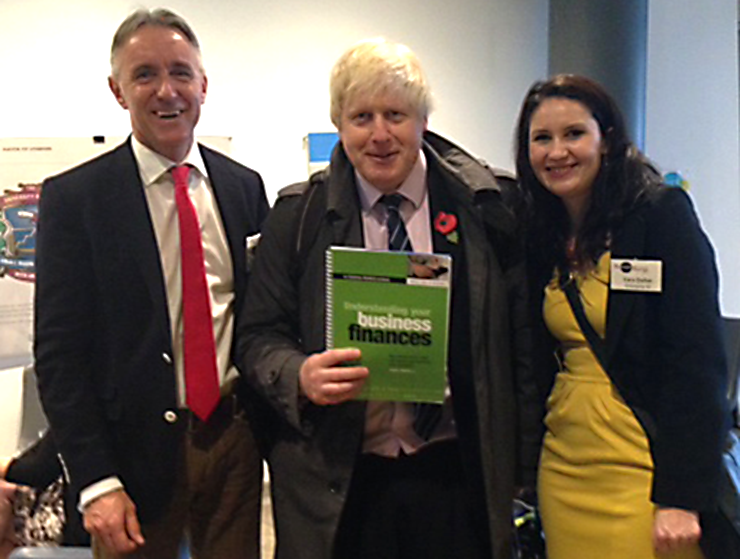 London Mayor, Boris Johnson, was shown a copy of our Understanding Your Business Finances workbook at the Start Up Loans Big Start Up Competition final, held at City Hall in London. The event was attended by a number of Start Up Loan partner organisations, including Enterprise Northern Ireland. The Start Up Loans Company have been using the finance workbook to run workshops, delivered by author Johnny Martin, for Start Up Loan recipients across the country. The latest workbook in the Essential Business series has been commended by leading business founders for its practical approach and comprehensive coverage. Understanding Your Business Finances, written by Johnny Martin FCA, offers expert guidance on everything from financial planning to managing accounts. This book is fantastic. It contains all the information you need on management finance. It took us a long time to get to grips with these things but you have covered them all – even things I thought you might not have, like depreciation and HP loans. The workbook is already proving its worth to new business owners. It is currently being used to train business start ups who have received loans from The Start Up Loans Company. Budding business owners in Enfield are benefitting from our Planning and Starting Your Business workbook under a new library enterprise scheme. The Enterprising Libraries New Biz programme is being delivered by Enfield libraries in partnership with Enfield Enterprise. The scheme provides six weeks of free training and advice for local people who want to start their own businesses. The programme ran five times during 2014, offering practical guidance on developing a business plan. The workbook is an ideal resource for this programme… it will provide participants with all the information they need to develop their business plans. It is clear, easy to understand and explains everything step by step. It also allows participants to make notes and develop their ideas as they go along. Enfield’s library service was one of ten local libraries to receive funding for business support under the national Enterprising Libraries grant programme. Our Thinking of Starting a Business workbook formed a key part of the KICKOFF IN BUSINESS initiative. This nationwide, field-based support service was launched by business start-up expert Ken Horn and was designed to help anyone thinking about starting a business. KICKOFF IN BUSINESS worked in partnership with football clubs all over the country to provide local people with impartial business start-up support. Ken said that their two-day events were “fun, interactive and entertaining and are delivered by fully qualified business advisory experts.” Launched in April 2012, KICKOFF IN BUSINESS helped over 2,000 people by the end of 2013. During 2011 and 2014, we worked closely with The Prince’s Initiative for Mature Enterprise (PRIME). 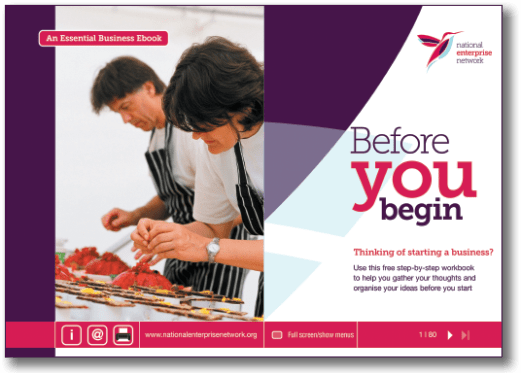 We published a bespoke edition of the Planning and Starting Your Own Business workbook, which was used in their PRIME small business workshops. The Preparing to Run Your Own Business course was designed to equip learners with the knowledge and skills to develop their business ideas into practical business plans. The course offered the opportunity to learn about crucial areas of business such as thinking about money and researching a market. Learners also prepared key pieces of work to help them set up their businesses, including a marketing plan and a business plan. For an informal discussion about bespoke Essential Business books and workbooks, please call Marianne Whitfieldon 0191 461 8000. For most of the latter part of 2010 and early 2011, the Essential Business team worked in partnership with the Small Firms Enterprise Development Initiative (SFEDI) on a range of business start-up materials: the Essential Enterprise series. We combined our knowledge and expertise to produce a number of workbooks and business start-up training programmes. They were specifically designed for use by business support organisations, their trainers, business advisers and clients, as well as for colleges planning to introduce enterprise as part of the Government’s Qualify with a Business (QWaB) initiative. The award was given for her volunteer work as president of the Brighton & Hove Chamber of Commerce. During her six years as vice president and president, Julie was instrumental in helping to build a strong and sustainable city Chamber.Julie Stanford, the founder of Essential Business, was awarded ‘Best Contribution to the Local Economy’ at the 2010 Brighton & Hove Public Service Awards. In September 2009, the founder of Essential Business, Julie Stanford was invited to be part of a panel at the British Academy of Management (BAM) conference, led by Brighton Business School at the University of Brighton. The panel discussed the value of academic research in business in light of changing Government policy. The panellists included Adrian Alsop (ESRC), John Baird (EPSRC), Roger Adams (ACCA) and Ossie Jones (ISBE and Liverpool). Professor Robin Wensley (AIM and Warwick) led the panel. “Business is traditionally a sector which is filled with impenetrable jargon and complicated language, which alienates customers and staff alike. The Essential Business Guide proves that it is possible to produce a comprehensive and useful guide to starting and running a business, without resorting to gobbledegook. In 2006, Julie Stanford, founder of Essential Business, was pleased to have been awarded a special commendation award for The Essential Business Guide by SFEDI. SFEDI is the national standard-setting body for the business support sector and is responsible for researching and disseminating what works best for small businesses.